A. 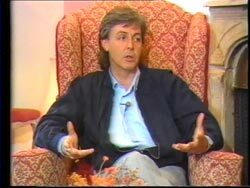 Title: Paul McCartney Discusses with Paul Gambaccini His Latest Album "Press to Play". somewhere in the south English countryside or even possibly in either France or Italy. " 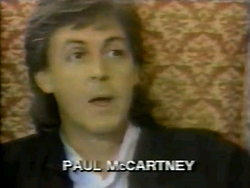 Source: Paul McCartney Discusses with Paul Gambaccini His Latest Album "Press to Play"
B. Title: Good Rockin' Tonite. 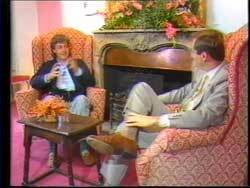 This may come from another interview taped on this date, or a clip from A (above). Capture of item B courtesy of Carsten K.
The Beatles on DVD © 2017 Bamiyan. Last revised on 8 March 2012.